Developer Play’n Go revealed this week that their slot Viking Runecraft has been nominated for a Game of the Year award from EGR. The release of this innovative slot sent shockwaves through the industry upon release. Not only has it consistently broken operator records, but it has somehow managed to create a crossover experience between online slots and mobile puzzle games. With the advent of mobile casinos, developers have struggled to find that perfect blending of arcade style, on the go play with the traditional design elements of a slot or table game. Play’n Go have achieved this balance with Viking Runecraft and it has not gone unnoticed by the EGR. Viking Runecraft will be up against other hot titles of the year including Age of Gods by Playtech, Queen of Gold by Pragmatic Play, Jurassic World by Microgaming and Dream Catcher by Evolution. With its 7×7 reel layout, Viking Runecraft certainly caught the public’s eye when it was first released. Its Nordic theme has been used in other slots before but never in such an effective and integrated way. A variety of gods can appear in this slot to help you out and with every win a player can level themselves up to unlock even more features which was an ingenious addition. It increases the slot’s replay value while also adding a sense of progression for the player. As their levels grew and grew, so did their in game rewards. This out of the box thinking is what has made Play’n Go a force to be reckoned with today; despite the studio’s relatively small size and this is the reason why the EGR decided to award this slot’s accomplishments. 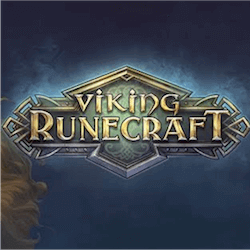 Viking Runecraft makes full use of the rich Viking lore that the slot is based on. There are 4 gods that can appear randomly in the main game and reward players with different combinations of wilds that appear on the reels, more often than not triggering winning combinations. This feature also links to the game’s Runes of Valhalla bonus feature where players can win this slots biggest jackpot. Vikings Runecraft also has the Charge of Destruction feature initiated by filling up the meter on the left of the slot reels with winning combinations. This feature can have one of 4 varied effects applied to the reels. The effects depend on which god initiates it. Players can apply the Fury of Fenrir, The Judgement of Jormungandir, The Scorching of Surtr or the Lure of Loki to the reels. Even though the competition is strong, Viking Runecraft fully deserves to be the EGR Game of the Year winner.